Wow. First a killer movie trailer for The Force Awakens that seems to support the fact that this new film has that classic Star Wars feel, cultivated carefully by Master-Director J.J. Abrams, drops online. Now, a trailer for the new Xbox One/PS4/PC game, Star Wars: Battlefront looks like the Star Wars game to play after nearly a decade drought of great Star Wars games that don’t have “Lego” in the title. My favorite Star Wars game ever is Star Wars: Rogue Leader (Rogue Squadron 2), a launch title for the Nintendo Gamecube (which actually arrived via Amazon a week before the Gamecube was released. Talk about a looooong week…). My 2nd favorite is PC’s RPG, Star Wars: Knights of the Old Republic, from Bioware. And of course, I also have a soft spot for all three Super Star Wars titles that cover the OG trilogy as Super Nintendo sidescrollers. But back in the day, Star Wars: Battlefront was quite the franchise as well; marrying the Battlefield mechanics with Star Wars characters, vehicles, and locales. It wasn’t perfect, but if the team behind this brand new Battlefront can nail the controls (like the perfect Call Of Duty: Advanced Warfare Xbox One control scheme), then it sure looks like the best Star Wars game in about a decade. 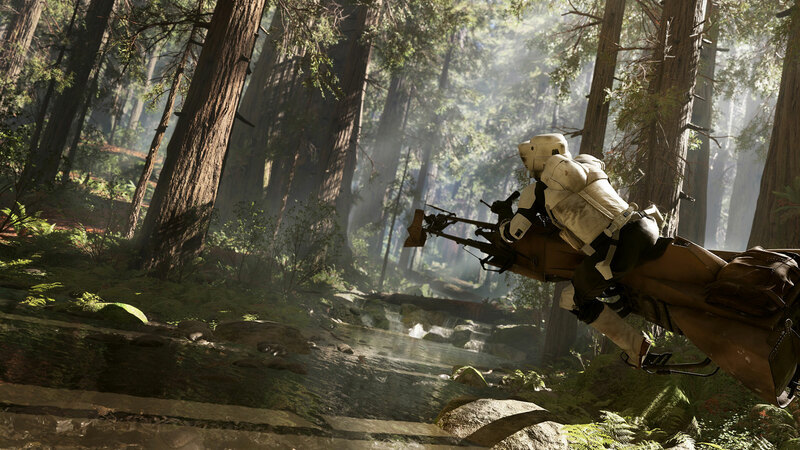 Watch the glorious trailer now for NEW Star Wars: Battlefront! Battles from the Original Trilogy, now with pristine graphics! Welcome back to Hoth, Mother Fuckers! If it comes out this year. Releasing it in December for the Holidays and when Force Awakens comes out is a no brainier. Or a missed opportunity. Of course, a Star Wars: Battlefront sequel/expansion featuring The Force Awakens time period and ships is also a no brainier. Whatever the case, Battlefront will live or die by the control scheme, as it’s obvious they have everything else down! Previous New JURASSIC WORLD Poster is 1st of 3: Trailer Coming Monday!